When we were loaned a DJI Phantom 4 drone, the first thing we probably should have done is passed it on to a responsible member of staff with sufficient drone flying experience to ensure that this £1,229 piece of equipment was in the safest hands possible. What we actually did was loan it to me for the weekend - to really put it through its paces as a kind of ‘Drone for Dummies’ experiment. I am not particularly coordinated, definitely clumsy and not particularly proficient at navigation. Of course, it boils down to more than it as a flying device - we also wanted to check its credentials as a filming device - with UHD 4K video capture (at a resolution of 4096 x 2160) it matches modern standards and expectations. The first thing to notice about the Phantom is that it’s a cool looking device, something from the future - and something that looks like a great deal of fun is to be had in flying it - and yes, a great deal of fun was had in flying it. Initial glance at the propeller-less device is intimidating, but fears are allayed when the propellers are attached with a single clockwise/anti-clockwise spin. Clever little markings of black and silver let you know which propellers go where - as they both have different orientations to ensure that the laws of physics are met (this is a massive guess…). Next is to remove the camera gimbal lock, a simple clip off and the drone part of the exercise is done! The remote control requires some more advanced setup initially - it needs a smartphone or tablet to be connected via the requisite USB cable and an app to be downloaded and opened. Once there, open the app and we’re ready for launch - it is crazily simple. Whilst I shouldn’t admit this post admission of clumsiness, I didn’t bother reading the manual for any of this - it was an easy and intuitive setup process. I previously mentioned that the USB cable is required to be connected to the remote for function, this may seem like a slightly rudimentary step backwards but actually, it draws charge from the remote thus ensuring the power hungry live view capabilities don’t entirely kill your phone’s battery. Now, I’m unsure as to the exact jobs the cable does here as clearly a wireless connection is required somewhere, but I do know a tethered experience removes the most annoying of barriers to quick setup which is connecting to a device’s own wi-fi network. It is true plug-and-play, I’ve always found devices with their own network to connect to are frustrating and slow to get up and running with. Powering up the remote control and drone requires a single tap of the respective power button followed by an extended hold - a single tap from standby on each device will simply show battery status represented by 4 LEDs. Once you hear the nice little welcome beep on the drone, and the remote control, you can go to ‘Camera’ mode on the DJI Go app and get ready for lift off. The drone takes around a minute at most to warm up, at which point it will declare to you that it is indeed safe to fly. It is worth noting that all experiences of the app were through an iPhone, so the android version may well differ. This is as simple as everything else that has taken you to this point - choose to launch via the app and slide across as if you were unlocking the screen et voila. Now, the drone launches itself safely up 1.2m and hovers, waiting for you to control it. Hovering is the greatest fail-safe in this little flying machine, if you get yourself into any trouble you can rest assured that you can stop controlling it and it will hover in place allowing you to correct any forthcoming wrongs. Control is intuitive, on the left joystick you control up, down, left and right. Whilst the joystick on the right will control backwards and forwards. In its simplest, base form this is as much as you need to take flight, and my goodness once you’re up in the air it is truly exhilarating. My virgin flight was filled with trepidation - there were fears of upsetting the neighbours, fears of losing or crashing the drone and surprisingly fear of looking up to see whereabouts the drone was in the sky. I found myself suffering from vertigo when I started to breach the 30m high mark, it’s an expanse up there and I started to mainly use the app to determine the position of the drone. This may seem like a risky move considering that I could have lost it, but I was only going up in a straight line early on. Also you do risk breaching the law on unmanned vehicle flight - which states that you must have visibility of the drone at all times. I had perfect vision of it, I was just too afraid to take advantage of that fact! Here is where the app actually really comes into its own for you, for flying the remote control is basic with it’s two joysticks but the app has a host of data for you to peruse - such as height, distance away and advanced controls for the camera and more. The joystick also has a couple of shoulder sliders to allow you to toggle through the camera gimbal position and ISO settings. As with everything to do with this gear, incredibly intuitive and make you feel like a pro after just a couple of flights. There are more advanced modes opened up by using the app - you can automatically follow a subject, you can tap to send it to a particular location and you can dictate paths. I used a couple of these features and found them to be OK, but I wasn’t overly happy about handing over direct control to the drone. I was cautious and felt more comfortable fully owning that control. Once my fear had subsided and I had a couple of flights under my belt I started to get more adventurous, pushing the device higher in the air and slightly further away from base. Again, a fail-safe on board the remote control and within the app is the ability to return home. So when you’re running out of battery or have simply got too big for your boots and are uncomfortable with your position - hit the home button and watch as it navigates its way back to you. The final safety feature that is of worthy mention is the obstacle detection system - fantastic for detecting objects in front of the drone, at which point it will not allow you to fly forward. Not so fantastic for detecting obstacles above it - which my washing line can attest to in a test where I wanted to push the limits of the system (which I did, the drone won and steadied itself - but it almost got itself into a pickle!). So this drone isn’t invincible - but it’s as close as you can get, it does a fine job of making this unknown and frightening to some technology much safer. Incredibly you can fly this thing as high as 500m - which is phenomenal considering when you see exactly how high that is. The max limit on my app was set to 120m - which is in keeping with the UK drone flying legal limit of 400 feet. There are real life tests out there where people push these limits, but you have to be really careful with what is the legal limit in the UK and remember you must have clear view of the drone at all times. There are some further laws which I will go into more detail about below. It was definitely beneficial to be aware of these, as they are a new thing the public perception (especially with us Brits) is to be fearful of it as a machine, and how intrusive it can be. I’d like to clear up the intrusion point immediately. This device is not designed, nor capable of, subtle intrusion - it makes quite a racket, akin to a strimmer, and uses a wide angle camera that doesn’t have a zoom feature. You can be intrusive as a human being if you climb over a fence to your neighbours with a camera and a telephoto lens, once you’re 50m in the air then everything becomes Google Earth! Although if you do want a drone with the zoom capability, the recently announced DJI Zenmuse Z3 is the camera attachment for you - although it is only compatible with DJI Inspire and DJI Matrice drones. Which finally allows me to speak about the camera - as a camera retailer I should highlight that this is a feasible aerial photography solution and not just a toy, it is just a really fun feasible aerial photography solution! I had heard some negative reviews of the camera as a stills device and took only a few stills from it, mainly because of the fact that I found moving image to be a far more compelling capture. The maximum image resolution is 4000 x 3000 which is only a slight improvement upon from the 4K video capture - so actually, any images I wanted I just grabbed from the video manually. It uses a 1/2.3” sensor capable of 12MP images, and has a 20mm equivalent focal length - as previously mentioned it doesn’t have any zoom capabilities - but I didn’t feel bereft at this lack of functionality, I felt happier that I could justify my field of view if questioned! There is also an ISO range of 100-3200 for video (up to 1600 for photo), which at 4K was rather beautiful - although I haven’t had the opportunity to view on a true 4K monitor, it looks delightful on a retina display. All imagery is captured on a micro SD card, with a maximum 64GB capacity recommended - also be wary that you will need one of the latest Class 10 or UHS-I versions to capture the 4K. The maximum file size it can produce is 4GB - roughly 10 minutes of 4K capturing. However it can record for longer, it just splits the files into 4GB chunks. Quality of footage isn’t solely down to capture capabilities - the gimbal which has a pitch -90° to +30° is kept incredibly stable by the on board 3-axis stabilisation. Pitch, roll and yaw are all optimised to keep your video looking like it was captured by a professional. The creators of the Osmo should be providing great stabilisation and they do! Looking back at my footage I was amazed by how they looked like somebody with actual skills panned out and panned round. There was some noticeably automatic left-to-right pans that were probably more to do with the pilot than the device! Fortunately here at Park Cameras, we have a talented drone-ographer in Marc Read, his footage of the Phantom 4 over Cuckmere Haven in East Sussex was some of his first he captured. It's a great showcase of the quality of footage you can capture from this fantastic gadget. What are the Drone flying laws in the UK? It would be very unwise to allow unregulated flight of drones, so fortunately the CAA (civil aviation authority) has a ‘dronecode’ for us UAV pilots to follow. You must make sure you can see your drone at all times. Don’t fly higher than 400 feet. Keep your drone away from aircraft, helicopters and airfields. If your drone has a camera it must not be flown within 50 metres of people, vehicles, buildings or structures. You must also not fly it over congested areas or large gatherings - such as concerts and sports events. 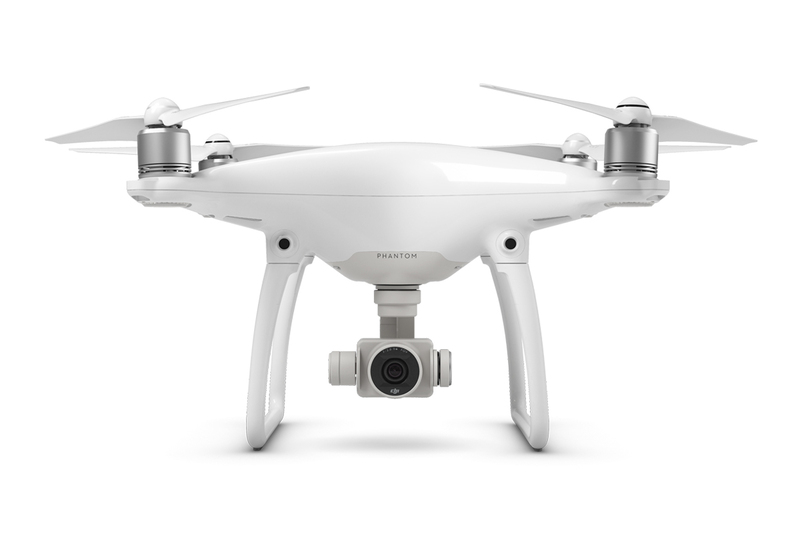 What are the differences between the Phantom 3 and the Phantom 4? When a new product launches, people often want to know the differences between the old and the new - and usually the new has a job when convincing the consumer it is a worthy upgrade. So it is worth taking a look at the new features in the Phantom 4 vs the Phantom 3. The battery provided with the Phantom 4 is a 5350mAh unit - resulting in an extra 3 minutes flight time on the Phantom 3 Standard, and a 5 minute increase in the 23 minute flight time of the Phantom 3 Advanced. The DJI Phantom 4 incorporates a system to avoid obstacles - with a sensory range of 2-49 feet. There is also an environmental requirement that the surface has a clear pattern and adequate lighting - so large white rooms in the dark should be avoided! Whilst the Phantom 3 4K and Phantom 3 Professional offer UHD video capture (4096 x 2160p), the Standard and Advanced versions do not. 4K capture is standard on the DJI Phantom 4. The Phantom 4 can accelerate upwards at 6m/s when in sport mode, an improvement on the 5m/s of the 3. Also, again in Sport mode, it has a maximum speed of 20 m/s which is a nice and noticeable boost on the 16m/s found in the Phantom 3 - ensuring it has that extra nip to it. All in all I could not recommend this drone any further - as a toy it is crazy fun, as a tool it is super effective and capable of great things - and everybody agreed that at its price it delivers. Battery life would be the only improvement for me, with 25 minutes going pretty quickly, just having one battery on hand isn’t a sensible idea if you want more than a quick blast on it - so I would certainly suggest an extra intelligent battery or two for extra-extended fun!